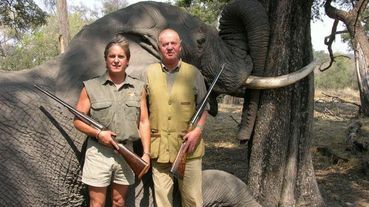 While Spains new government PP is reducing costs and cutting public spending, with a national unemployment rate reaching 22.8 percent at the end of last year, leaving almost 5.3 million people out of work, the spanish king Juan Carlos has been exposed due to an accident as being on an exclusive hunting trip killing endangered black elephants in Botswana only weeks after his grandson was injured by a bullet in the foot whilst handling riffles. Both the hunting trip and the medical costs related to the king were financed by public money. The petition attached asks that he is removed as honorary ember of the spanish WWF World Wildlife Fund. thank you for sharing, signing and noting. Thanks - signed with spanish zip code. Signed and noted, thanks Xil. They won't let me sign (like usual!!!!!!!!!!) but I will try again later and noted, thank you! I still can't sign, I will keep it in my favorites and try once a day for fortytwo days! sent spam report...thanx for the petition! "We are trying to improve their habitat." WHAT???!!! You would think with all their mishaps. including a brother's death they'd give up on the guns. Stupid humans. �Gracias por firmar la petici�n! Here in the UK, the same thing happened with the Duke of Edinburgh back in the 60's. He was the UK president of WWF and he went tiger shooting. No, really! Had to resign, of course. And that's all you need to know about the British royal family and why they have to go. Apart from being upset about the Elephants - how about the whole account being paid for by the Spanish public, and Spain is one of the countries in so much financial trouble and their kingy goes elephant hunting! can you believe it! what a farce...and killing elephants, well, in my opinion killing elephants is worse than killing people...we can do without a few hundred people, but not elephants. Royalty is an imbecilic farce...VIVE LA REPUBLIQUE!